This is one student’s response uncut. Enjoy. “Though I am preoccupied with other matters, such as the fact that I, the notorious cad, Victor Caspian am currently locked inside of an Olive Garden Restaurant filling with water, I will devote some of my time to solve and answer these geometrical questions, only because it will aid in my escape. The inquiry as told by accomplice Gerald Flats, was to describe and possibly exemplify the three ways to prove congruency among two scalene triangles. Nothing of a challenge for my superior wit, I have a degree from the regal Oxford University, it doesn’t matter if was a masters in Medieval Literature, it’s still a Masters Degree. But I digress, there are three instances that I have surmised that can be used to conjugate these triangles together by unfalsifiable congruency. The first being the use of rigid motions as proof for such. You see my dear geometry instructor, there is the simple matter of identifying the figures as to whether or not they have been subject to a shift with out accretion or reduction in size. Namely, this example appears to be a translation as all points from one triangle to another moved in a parallel shift from one position to another, without any alterations in volume. This thusly proves congruency. If you are left unsatisfied, then you shall be annihilated sometime in the near future, but should you conceded to my next, penultimate example of superior intellect, you shall be spared…to Some degree. Another way of proving this is by using the method of measuring all the sides and angles of each triangle, creating an impenetrable barrier of logical force that crushes all doubts in its path. This can be done by simply using a ruler, protracter, pencil and something to write on, perhaps a granite slab, a priceless jewel or paper. One must simply measure accurate lengths and widths of all line segments on each triangles as well as all their angles, totaling to six pieces of data, and so long as all the data corresponds with another part of the information, congruency is proven. Should you be a skeptic still, you have lost your chance to thrive as your inferior genes do not need to be stirred into the cesspool that is our genetic universe. This shall be final piece of evidence to show you that these triangles are congruent, but it’s not like it matters, the laser will incinerate you by the time you finish this paragraph. The final method my doomed reader is the method to which I refer as the Side, Side, Side method. This redundancy is a statement that claims so long as one measures each of the sides on all the triangles, and should they correspond, they are congruent. This is a cut off from the previous method, should the person actually doing this be, say an average American and too busy scarfing down cheeseburgers to really think. Thank the lord that you will cease to exist in 3…2…1. Now that the insolent of all of my readers have been destroyed, I find it best to beseech others to hear my cries as I and Gerald have made it out of the flooding Olive Garden, but are now inside a burning McDonald’s. We have found a mysterious, poorly placed fire hydrant on the ceiling, with some sort of hindering passcode technology that is asking for another geometry question, this is getting quite annoying, but since I have third degree burns on my foot, I don’t have much time. The question is how can my aforementioned Side, Side, Side method and the strange Side, Angle, Side method be used as a shortcut between the overall measurement technique. In previous years, we have stuck to a textbook that was aligned to the Michigan Merit Curriculum. We used the book as the backbone and central nervous system of our class. Vocabulary, notation, structures, and other things were decided by what the book used. The book wasn’t bad. The Common Core doesn’t align at all. It forced us to scrap the book. It may have been the best decision we could have made. Our recent liberation from the textbook has been a huge benefit to our students. “The proof” is a hallmark of most geometry curricula. Most text books push the structure of “two column proof, ” (you can see an example here if you aren’t familiar with two-column proofs). The biggest problem with two-column proofs is the lack of engagement. They seem unapproachable, unnatural to students. The students aren’t sure how to work with them and because of their rather unique look (can you think of any other form of writing that looks like that?) it is tough to connect the two-column structure to any of their previous experiences. So, the problem with students not being able to “do a proof” could be more of a problem with the two-column structure than with their ability to support a mathematical statement. Today, I gave them the problem at the top of this post. I gave them an image with four facts. 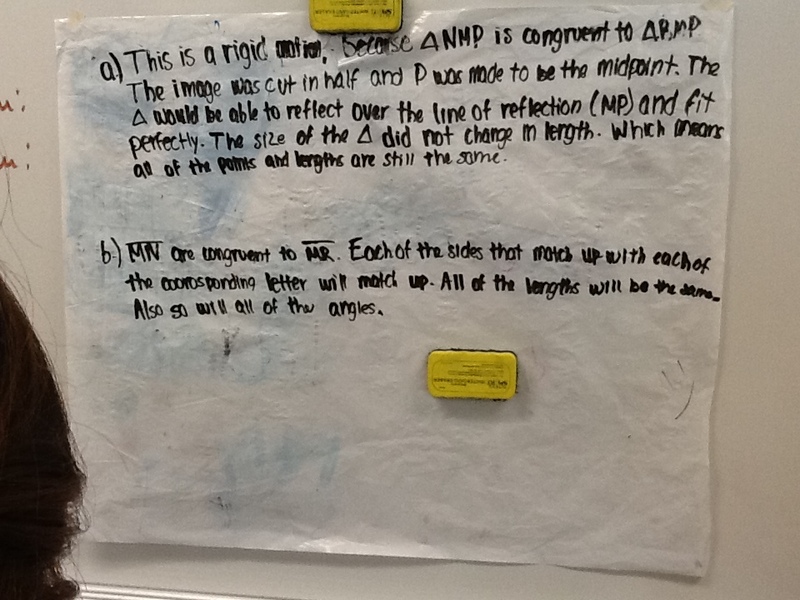 Their task was simply to explain why the two triangles were congruent, but to write two different explanations. 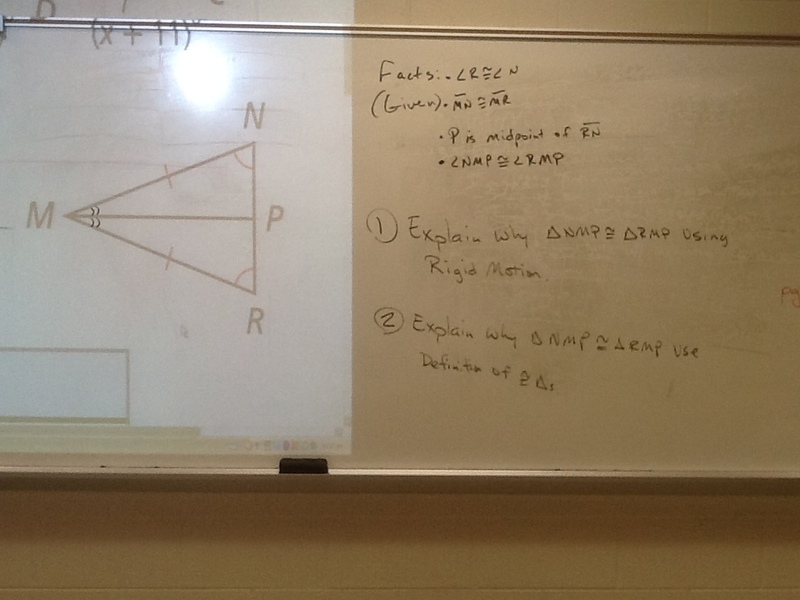 The first used rigid motions to support their argument and the second used the definition of congruent triangles. I told them that they could write “paragraph-style.” I have some who choose bullet points, but not many. Engagement was over 90% across the board. Students weren’t all confident in their answers, but they all had answers. They had all written a few sentences for each. And it didn’t take a lot of wrangling to get those sentences. In previous years, I might have had half the class try and the rest practice their avoidance behavior, claiming they didn’t know how, “collaborating” with neighbors, asking to use the restroom. Here’s to hoping those days are gone.